Muharram is a month of remembrance & Shia Meditation that is often considered synonymous with the event of Ashura. Ashura, which means the “Tenth” in Arabic, refers to the tenth day of Muharram. It is well-known because of its historical significance and mourning for the martyrdom of Hussein ibn Ali (AS), the grandson of Prophet Muhammad (SAWW). Alhamdulillah by the Grace of Allah (SWT) the Bilal Muslim Mission of Tanzania was able to carry out a number of activities during this month of grief in all it’s 75 centers in 6 regions. Majalis were conducted in all centers for 12 days of Muharram, the majlis started with the recitation of the Holy Qur’an then Marshiyas in Kiswahili, speech was delivered followed by Mataam and Niyaz. About 1300 T-shirts with the message of Karbala were distributed on the day of Ashura in all BMMT Centers. One Thousand (1000) copies of LABBAYK YA HUSSEIN! Books were distributed in all centers of BMMT, along with other BMMT books which reveal the tragedy of Karbala and the AhlulBayt (as). BMMT Calendars: for the second year now BMMT published its Islamic Calendar and it was distributed during the 12 days, 2500 calendars have been distributed. 60 Black Khanzus for Hawza boys and 150 Black Hijabs for Madressah girls were distributed. 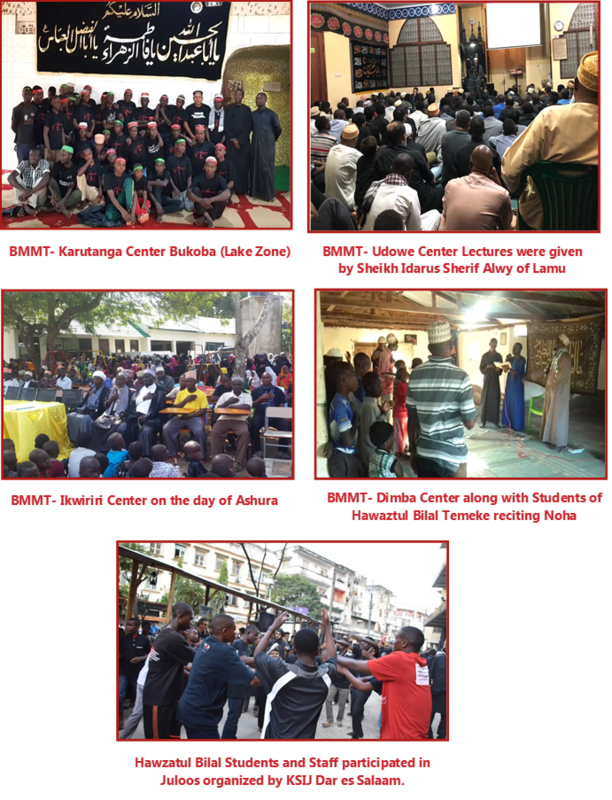 The BMMT Office had a stall at the KSIJ Imambaragh – Dar-es-Salaam during the 12 days of Muharram which helped make the Community members aware of the activities BMMT are involved in. As our aim is to propagate the true religion of Islam and the teachings of AhlulBayt (AS), a total of 21 students from Hawzatul Bilal – Temeke, Dar es Salaam were sent to Dimba, Newala, Ikwiriri, Msata, Mbog, Moshi, Kileo and Kikavu to do Tabligh and deliver the massage of Abi Abdillah Alhussein (AS) and the tragedy of Karbala to the Bilal community. The Mission wishes to thank all the donors for their continued support in all our activities during Muharram 1440 AH/2018. May Allah (SWT) reward you in your life and hereafter. Ameen.